Employer social security contributions account for 26.8% of labour costs in France, which is the highest among OECD countries. Employer social security contributions account for more than 20% of labour costs in nine other countries - Austria, Belgium, the Czech Republic, Estonia, Hungary, Italy, the Slovak Republic, Spain and Sweden, the report says. As a percentage of labour costs, employee and employer social security contributions combined exceeds 20% in more than half of the OECD countries. It also represents at least one-third of labour costs in eight countries: Austria, Belgium, the Czech Republic, France, Germany, Hungary, the Slovak Republic and Slovenia. Most OECD countries provide a financial benefit to families with children through advantageous tax treatment and/or cash transfers. 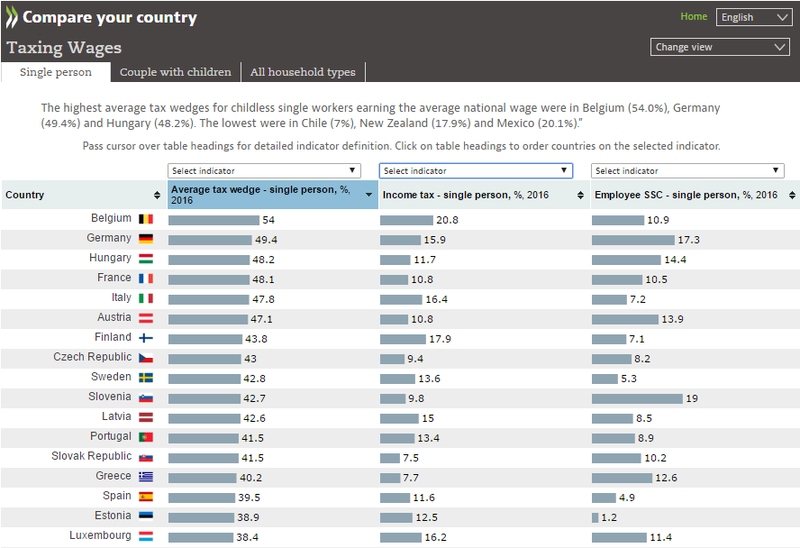 The difference between the tax wedge of a one earner couple with two children compared to a single worker is greater than 20% of labour costs in Luxembourg, and greater than 15% of labour costs in six other countries – Belgium, Canada, the Czech Republic, Germany, Ireland and Slovenia. On the other hand, the tax wedges were unchanged in Chile and Mexico and differed by less than three percentage points in Greece, Israel, Korea and Turkey. Between 2015 and 2016, the tax wedge of a one earner couple on average earnings with two children increased in 23 OECD countries, fell in 11 and remained unchanged in one. Tax wedge trends between 2000 and 2016: For the one earner married couple on average earnings with two children, the tax wedge declined in 23 OECD countries and increased in 12 over the 16 year-period: The largest decline was 11.2 percentage points in Canada. There was also a decline of more than 10 percentage points in Hungary (10.2). There was a reduction in the tax wedge of more than five percentage points in five other countries – Australia (5.3), Israel (6.1), Sweden (6.4), Ireland (7.2) and New Zealand (7.4). The largest increase was 10.8 percentage points in Iceland. There was an increase in the tax wedge of more than five percentage points in two other countries – the Czech Republic (5.2) and Mexico (7.5), the report says. More details here. Read also recently published Deloitte European Salary Survey saying that employer costs for work in the Czech Republic are the highest in Central Europe.